It was still raining when we got up. We emptied the tent and pulled it under the pavilion and tried to dry it as best we could. There’s nothing worse than packing a wet tent. We decided to wait it out, but not there, back at the BP where we could get some breakfast. Once again Bill asked where I was from and refused payment for coffees, even after I insisted. I was beginning to think Bill may be a few cents short of a dollar, but his heart’s in the right place! Another guy in a panel van insisted we put the bikes in the back and ride with him. We told him we couldn’t do that, we ride rain, hail or shine. 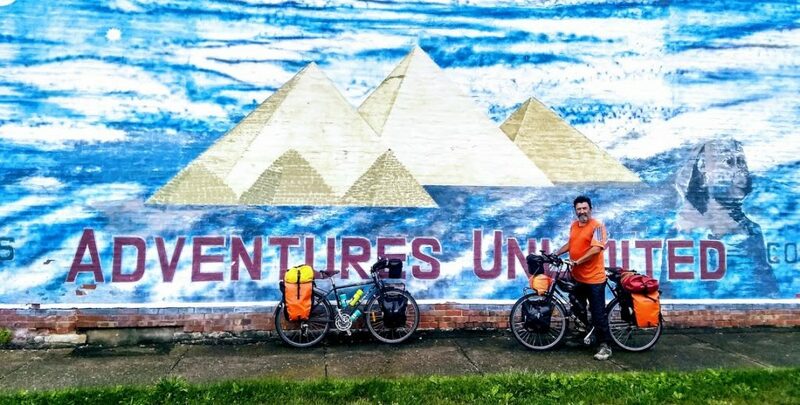 He meant well and it was hard to knock back his offer as people genuinely like to help, but there’s some things only touring cyclists will probably understand – we’d rather be out there in it riding – simple as that! 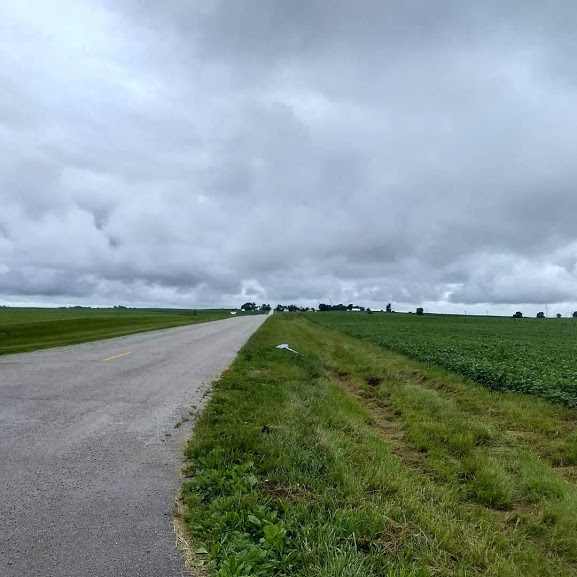 At 11.15am, we set off out of Ashkum, crossing over Interstate 57 and heading north once more and cutting through the cornfields on the much quieter back roads. The skies looked ominous and we figured we’d be riding in the rain for the most part, but for now it was holding off. We turned onto the 4 and headed west toward Odell. Big, black, angry clouds were forming fast to the south of us. It would be a sprint to the finish, aided by an ENE wind that had helped us along all afternoon. We eventually turned north on the 6 into Odell and rode into the centre of town. We had no time to waste as we asked directions to the community park from a young woman and headed straight there. It was opposite the swimming pool and had a decent sized pavilion. We asked the lifeguard at the swimming pool about the toilets and he said he’d keep them open for us tonight. He mentioned that the Cycle USA for MS group had camped there last night. Still the rain held off, but the entire sky was now black and the light was fading fast. We were camped right next to the old, and famous Highway 66. There are only odd, decaying sections of it remaining now between Chicago and Los Angeles. I crossed over it to get to the BP to buy some food and beers for dinner. The BP was full of Route 66 paraphernalia, so, being me, I bought a sticker. After all, we’re not riding it, just the width of it tomorrow on our way out of town! Sure enough, on my way back, carrying everything, the clouds burst and the wind blew up and I was getting very wet, very fast. 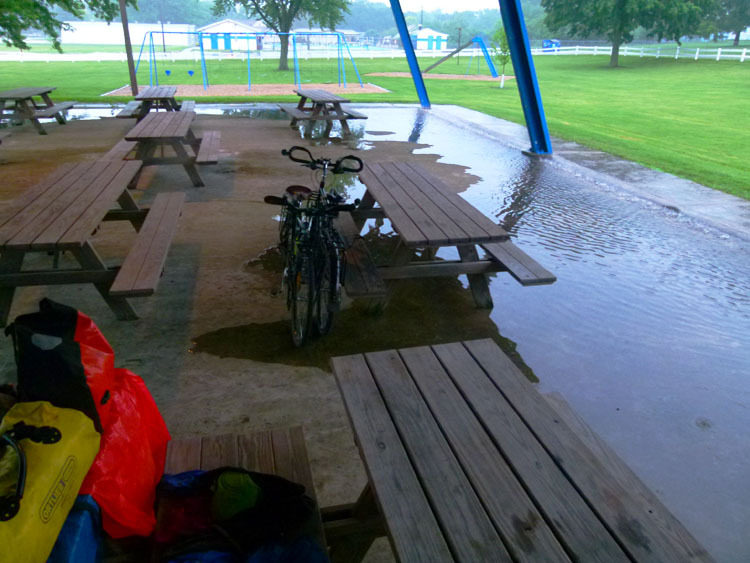 I made it back in time to rearrange the picnic tables into some kind of order so we could sleep on them instead of the floor, which was now quickly filling up with water. Some brainiac had designed the floor of the pavilion to be about 3 inches lower than the grass surrounding it. In not much time at all, we were marooned on the tables in the middle of a wide pool of water with the wind howling through trying to blow our sleeping gear away. There was nothing further we could do. We had prepared well and everything we had was dry (except the tent). We casually ate our dinners and drank our beers while watching the wind play havoc with the nearby cornfields. After about an hour it began to settle down. 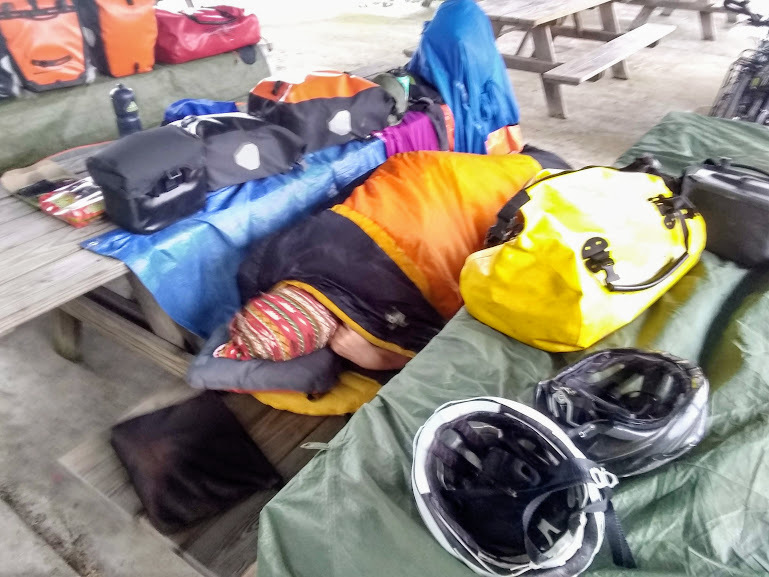 We finished our beers, visited the toilet and got our sleeping bags ready on the picnic benches, our tarps acting as windbreaks to keep us warm. Just another night on the road! 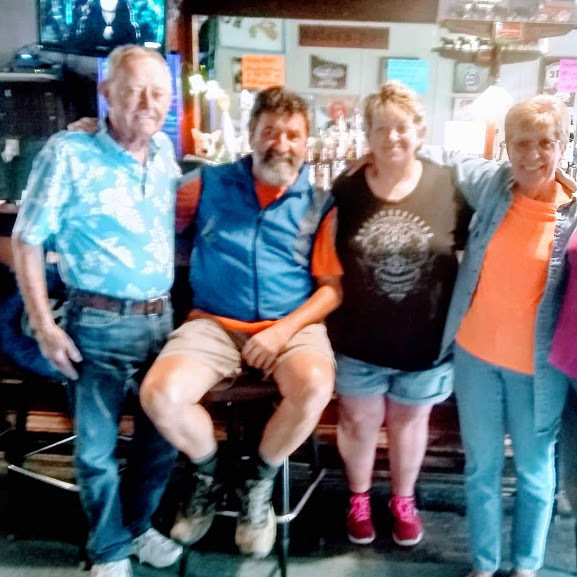 In the morning we crossed over Route 66 to the BP and shared breakfast with a group of older, very enthusiastic locals that wouldn’t let us get a word in sideways! Still, the coffee helped and one lady was very interested in the Warmshowers concept, we told her Odell could use one. Breakfast done and dusted, we rode up and over Interstate 55, the replacement for the old Route 66, that bypasses all the small towns and keeps all the main traffic off their streets. The loss of traffic though is a loss of business and many of the small towns alongside the Interstates now suffer as a consequence. From here we crabbed our way north-west through the corn again to the intersection of the 17 and the 23 just south of the town of Streeter. 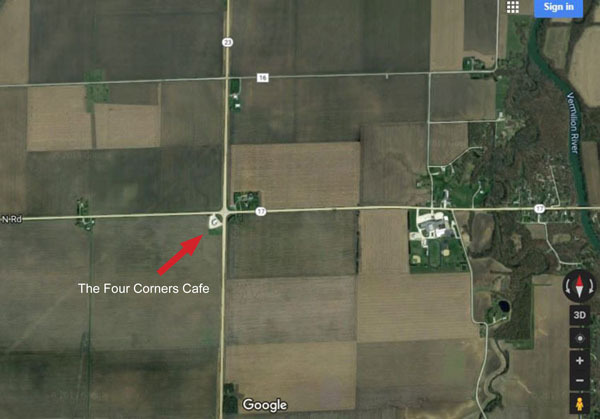 Here on the lonely intersection was a cafe called “Four Corners” and we figured it looked like a good place for lunch, being roughly halfway between Odell and Wenona, our destination today. We parked the bikes out front, entered the cafe and got ourselves a booth. The young, blonde waitress was a real livewire, wanting to know what we were doing and where we were heading. We ordered coffee and a hot lunch and she made regular stops by to fill our cups. One old fellow overheard and came over to inquire about our trip, we chatted for a while, he seemed to know a lot about bikes. When he asked if he could look at our bikes, I obliged and took him outside to show him. He was very inquisitive and asked all kinds of questions as I explained our setups. Back inside, he wandered back over to his table and his friends. We finished lunch and asked for the bill, but our waitress said the old fellow had paid for it. He never stuck around for a “thank you”, just picked up our tab and left. Wow! We were blown away! As much as the corn and soy can get a bit monotonous, the hospitality and generosity of the people make it all worthwhile. We tipped the waitress, who earned it, and got back on the bikes and headed south. Back on the 17 again, we turned west and rode directly to Wenona, almost! We had booked a room at an America’s Best Value Inn just south of town. There was just the hotel, a BP, a Burger King and a closed down casino alongside the Interstate 39. It was pretty soulless, but we managed to find a beer and something to eat and the room was pretty good. It was a pretty short day again today, just 35kms, so there was no hurry getting out of bed. We crossed the Interstate heading west for most of it, then turned almost north up Tax School Road and then down the biggest hill we’ve ridden so far this trip. 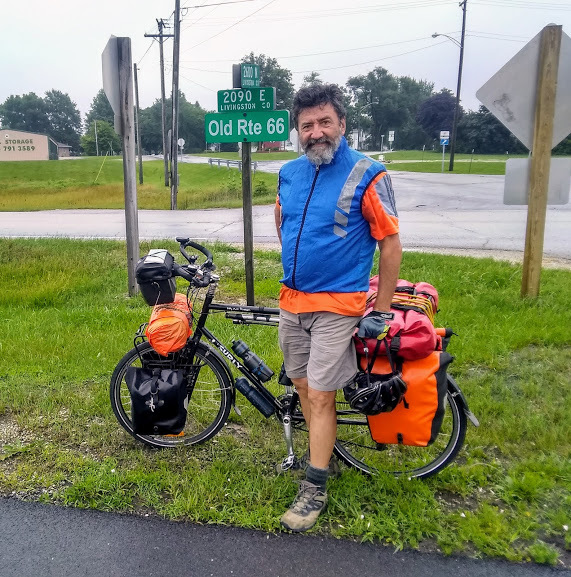 We had crossed into the Illinois River Valley and enjoyed every moment of freewheeling down the long, steep hill at about 30 mph. We negotiated the rather steep, narrow bridge spanning the river and found ourselves in Henry, out destination for today. The first job was to check out the Waterworks Park, their equivalent of the community parks we had been camping in so far. It was down a steep bank next to the river with a tiny pavilion with a couple of picnic tables under it. It was small, but there was only us and it would be fine. The river was pretty swollen and really heaving past us, but hey, what could go wrong? We decided it was way too early to pitch a tent, so we rode up into town and got ourselves a hot lunch at Gibson’s Bar and Grill on Park Row Street, opposite the park. Lunch was OK, but there was no-one around. 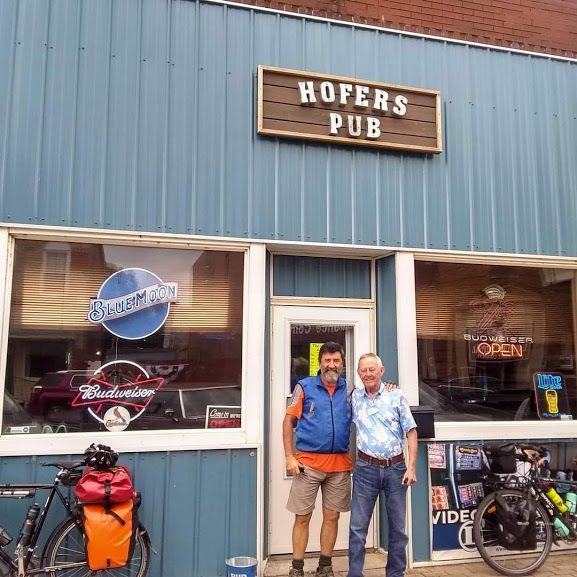 So we headed a block over to Hofer’s Pub and locked our bikes up out front. This proved a masterstroke as the locals were already in there having a good time joking around with each other. We ordered a couple of beers and quickly earned our novelty value as they took us on board and had us tell our story yet again. We’ve got a pretty good story though, and it’s always worth a few beers, as we found out once again! Having brightened up the day of some of the locals, we were soon getting photos together and plenty of advice, some of which I wasn’t too sure about! We left while the going was good and said our goodbyes out the front of the pub where we posed for some more photos. A quick shop for dinner and then we rode back down to the park. I got out the tent and stood it in the sun to dry it out, it was still pretty damp from the downpour at Ashkum a couple of nights ago. While we were having something to eat, an older guy in a pickup truck pulled up and told us the local Catfish Tournament would be having their weigh-in here under the shelter tonight, it was an annual thing apparently. He reckoned they’d be back to do the weigh-in at about 2 am and it would last about 90 minutes – bugger! So I moved the tent to the rear of the park next to an old fire truck, well out of anyone’s way. It had dried out nicely, now all we had to do was wait till 2 am and see what would ensure. Other than the extra lights, the weigh-in wasn’t that bad for us. I actually got up and went and watched it as I figured it would be a great way to witness some local culture. There were about 30 guys and one woman there. They all looked like extras from the movie Deliverance and spoke in a strong, country accent. Prizes were awarded for the total weight of fish caught, and for the largest one. I think that one was around 11 or 12lbs. All fish were unceremoniously dumped back in the river after weighing and recorded on a large whiteboard with their 2 person team names. True to his word, it was all over and packed up by 3.30am.